Cleveland, OH – Three-time GRAMMY®-nominated Motown Artist, KEM, has announced dates for his 2015 U.S. 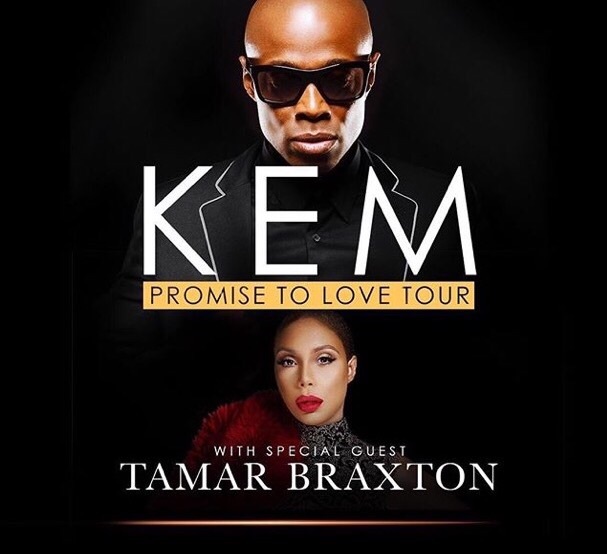 Headlining “PROMISE TO LOVE TOUR” with special guest, TAMAR BRAXTON. KEM’s “PROMISE TO LOVE TOUR”, named for his current CD, stops at Playhouse Square’s State Theatre on Saturday, November 28 at 8 pm. Tickets go on sale on Friday, September 18 at 11 am priced at $103.50, $83.50 & $63.50. (*VIP Ticket Package info below.) Tickets will be on sale at playhousesquare.org, 216-241-6000 or the Playhouse Square Ticket Office. R&B singer-songwriter, TAMAR BRAXTON is set to release her highly anticipated third album, Calling All Lovers on Friday, October 2. The album includes her hit single “If I Don’t Have You”. TAMAR is a contestant on the 21st season of ABC’s popular TV show “Dancing With The Stars.” Her #1 rated daily talk show, “The Real” has returned for its 2nd season on FOX. In what continues to be a banner year, a tireless BRAXTON is getting ready to bring her music to her “Tamartian” fans live across the country. Fans will have the chance to gain exclusive access to KEM during the Promise to Love Tour with VIP Packages that are available for purchase. The VIP Packages include: Tour of KEM’s tour bus with KEM as the guide; Pre-show reception with KEM; Early VIP access to the venue; Photos with KEM; Autographed items; KEM merchandise; etc. More information is available at www.MusicByKEM.com. With the purchase of every two (2) tickets to the Promise To Love Tour, fans will receive one (1) physical copy of KEM’s Promise To Love CD, along with one (1) download of the album. (Offer not available for tickets purchased for shows in the following cities: Baltimore; Columbus; Dallas; Louisville).